GridDrones flown by Rick Astley! – ixd! In case you are wondering, Rick Astley did not let us down. What a fun experience! For more information on the research related to the GridDrones programmable matter platform, visit the GridDrones project page. On October 11, Rick Astley was a special guest on the Spanish TV show, El Hormiguero 3.0 and tried his hand at controlling a drone swarm in the shape of a butterfly! 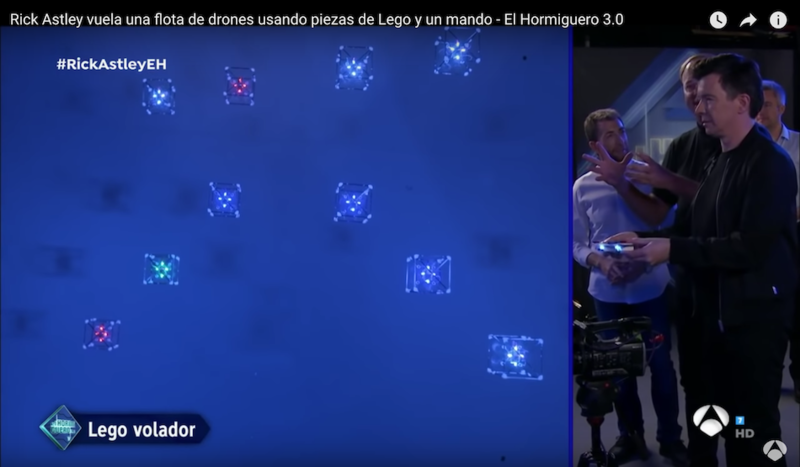 Pablo and Patricia from Antena 3 invited the team to bring the Flying LEGO Bricks drone experience to a live studio recording and demonstration. GridDrones has been under development since 2014 by the Human Media Lab researchers: Sean Braley, Calvin Rubens, Roel Vertegaal, Antonio Gomez, and others. Tim Merritt teamed up with HML and LEGO’s Creative Play Lab to design and create the Flying LEGO© Bricks experience that 250+ children played with at the LEGO© World Expo in 2018. Calvin Rubens presented an academic paper at UIST 2018 to debut the design and intended application scenarios for the GridDrones system. Based on evaluations with children and adults, flying the drone swarm with a tangible controller seems to be widely appreciated, with some users being very proficient with little practice time. The system supports direct touch control of the flying pixel positions and is one of the first examples of self-levitating programmable matter!